CEMIX MASONRY MORTAR MIX is for professional trade brick and block mortar jobs. It is ideal for all types of masonry work. The mortar displays a high level of workability and coverage, especially suited for the professional brick/block layers. It complies with NZS4210; 1989 for masonry construction. Dampen the clay bricks before laying them. Concrete blocks should be laid relatively dry. Empty contents into a wheelbarrow, mechanical mixer or onto a smooth non-porous surface. Add water gradually, mixing thoroughly until a smooth mix is achieved. Do not over mix. Under ideal conditions a bag of 20kg would require approx 3-3.3 litres of water. Damp the clay bricks before laying them. Concrete blocks should be laid relatively dry. Place a layer 15 – 20 mm of mortar between layers of bricks / blocks. The joint gaps are usually 10 – 15mm. Pointing is easier after the mortar has initially set. CEMIX MASONRY MORTAR MIX consists of a uniformly blended, properly proportioned mixture of sands, Portland cement and other admixtures approved for use in mortar to improve workability and performance of the product. The data shown above reflects typical results based on laboratory testing under controlled conditions. Reasonable variations may occur on site. 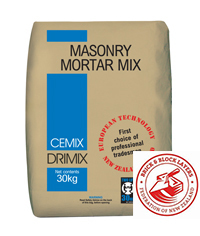 CEMIX MASONRY MORTAR MIX in a cool dry area and use within six (6) months. Clean all tools with water & brush immediately after use.